Climbers were prepping their gear on the tail beds of their trucks an hour before the sun came up. I lay there listening to them deciding which cams and gear they were taking with them. In the far distance the sounds of the elk bugling bounced off the granite walls echoing around the meadows. There was no going back to sleep now and the only thing for it was to get up and take advantage of the early hour. It was that sliver of time when my chances were slightly higher of seeing some wild frends roaming before the sun rose and chased them into the cover of the forest for the day. I decided it was a day for a new route and took off down the dirt road marked 'dead end'. I manoeuvred the old van down the rutted stone strewn road and it reliably rattled along bouncing me inside. At first when I saw them off in the distance with my naked eye I thought they were pronghorn, their colouring mottled brown with flashes of white. Before that idea could settle it was almost as quickly gone as it had come, with the sudden realisation of what I was really seeing. After a few moments of taking in the scene and realising they were wearing radio collars there could be no doubt. Wolves. Three individuals in front of me feeding on at least one carcass. The ravens circled and cawed above the scene, coming in intermittingly for their share. I stood watching almost frozen but not with fear for wolves don't frighten me. I was riveted to the spot like you rivet when you know you're having one of those special moments that don't come along too often. An instance in time that you feel every precious second of. The last time I'd seen wolves it was a pack of nine, eight black and one white, on the northern border of Yellowstone at daybreak on a cold January morning last. A few months later the rare white alpha female we spied that day was shot and killed not far from where we saw her in Gardiner, Montana. Authorities still haven't found who murdered her and our sighting of her was a gift that won't come along again. I stood there in Grand Teton National Park this morning fully engrossed and thankful for that split second decision to not take the time to make a cup of coffee as I began my day. Beady eyed, I watched and they watched me. One took off into the trees and I was sure it was a signal for departure of the others. As the sun went higher a howl rose up from the forest and as if in unison so too did the hairs and the goose pimples on the surface of my skin. I was alive. This was just a reminder of what that means. Then it came again. A howl this time from behind and I turned to see another individual staring back at the scene that I was now in the middle of. Perhaps the only thing more remarkable was there was no other human around. There I was and here I am. A woman from soft green Irish drumlins and stony grey soil surrounded by Tetons and Yellowstone. In the company of wolves. Beauty and the Beast, In the shadow of the Tetons. Along a fault line in the earth's crust two worlds collide amidst enormous geoligical pressure and energy and thrust upwards to form what is undoubtedly one of the most graphic statements nature makes in North America. The Grand Teton range in northwest Wyoming thrusts upwards from the valley floor unobstructed by foothills, announcing its grandeur as a defining feature of this part of the great Continental Divide. The Tetons and surrounding valleys are part of a place whose energy is visible and palpable everywhere you look. In the granite peaks pushing evermore skyward, you see it. In the warm springs that bubble on the surface, sending rivulets of steaming, healing water through the sage brush meadows of the valley floor. In the great rivers like the Snake and Gros Ventre that were vital to the survival of the native peoples of the continent and the european settlers who then almost destroyed them. Yet the energy that connects more than anything to my own is that generated by being in such close proximity to some of the most majestic species of wildlife to be found anywhere on the continent. Jackson Hole and the Grand Tetons lie within the Greater Yellowstone Ecosystem (GYE), one of the largest intact ecosystems anywhere in the world. The GYE covers 14 million acres, 6 million of which is designated wilderness. A journey out anyday could present you with any number of hundreds of species of birds, reptiles, amphibians, mammals and fish. In the few short months I've been here I've encountered bald and golden eagles, moose, cougars, bison, barn owls, elk, pronghorn antelope, trumpeter swans and beavers. People come from all over the world to this corner of northwest Wyoming to experience one of our last great wild places and the animals that make this place so biologically important and unique. A visitor can feel and see for themselves the heartbeat and magnetism of the place. I'd say most leave changed having experienced it. Gus the Golden Eagle, ambassador for his species at the Teton Raptor Center in Wilson, Wyoming. Here too one feels another type of intense energy that constantly bubbles on the surface of this place. Like the continental plates on which they live the human and animal world collide where human encroachment and interests clash with wildlife habitat. In Grand Teton National Park and the Greater Yellowstone it could hardly be more pronounced. 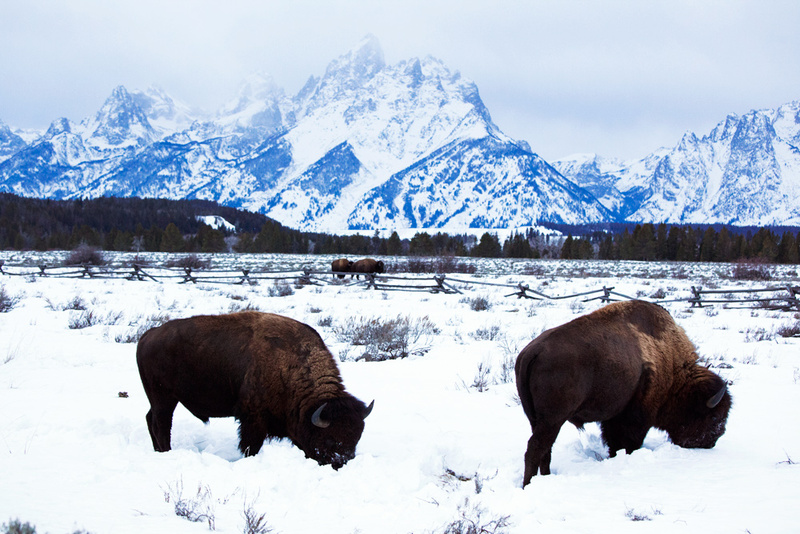 Hunting is a huge part of the culture and life of Jackson Hole and hunting/harvesting within the Grand Teton National Park, the National Elk refuge nearby and surrounding public lands is allowed under restricted permits. Moose, elk, cougars, beavers and bison are just some species that can be 'harvested' by the public for a fee through programs designed by federal and state agencies and their biologists to manage, monitor and control animal numbers bringing them to levels that the agencies deem 'sustainable'. With so many large game of varying species vying for resources alongside humans who are either trying to shoot them, control them or save them the area is a hotbed of widely differing interest groups. A hunter who had come from California tags his cow elk kill in Grand Teton National Park. 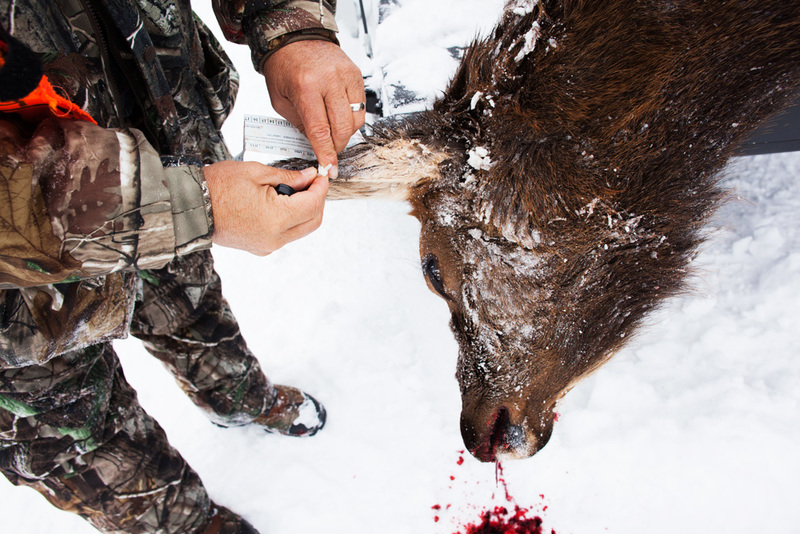 In this atmosphere Jackson Hole's hunting season brings controversy almost every year. This year being no exception when hunters violated regulations within the national park in full view of groups of individuals on wildlife safaris. The dichotomy is real here. This season's wild bison 'harvest' on the elk refuge took the largest number of animals thus far - 300. Wildlife managers are happy that they are on track to reducing the Jackson population to 500, a sustainable number according to their own observations. Further north the bison that roam outside the boundaries of Yellowstone National Park and into the public lands of Montana are eradicated in an interagency plan to stop the spread of brucellosis and protect the livestock industry. As with anywhere where humans and wildlife meet, one man's species to be protected and gaze upon wild and free is another man's food or trophy stuffed and displayed above the mantel at home. It is an intense place to be as the complexities of human and wildlife interaction unfolds. Elk on the National Refuge, Jackson Hole. In attempts to understand these interactions and protect species from abuse there are a myriad of non profit conservation groups and long term study projects scattered everywhere throughout the Yellowstone ecosystem. In an area that I once heard referred to as the Serengeti of the lower 48 some of the world's leading scientists, naturalists, and biologists are here working. Groups such as the Teton Cougar Project are doing groundbreaking studies on big cats and threats to their existence in this vast area where little was known before about these animals. In a world increasingly devoid of wildlife it is in a place like this that human beings are faced with the questions and challenges of how to live in harmony with the species we share the planet with. In man's quest to dominate life on earth we have used, abused and are actively wiping out entire species everyday. Yet against this backdrop of destruction there are incredible numbers of individuals working to understand and save what is left of our wildlife. No where I have I come closer to it than in the shadows of the Teton range where beauty and the beast come face to face. The only question left being, who and what is beauty and who and what is the beast? Moose taking an afternoon rest near Kelly, Wyoming. Wildlife, a thing of the past? It was an interesting conversation with Paul my local greengrocer the other day when I remarked on the aisle of birdfeed in his store that has recently appeared. What has caused this contemporary phenomena in Ireland of everyone en masse feeling the need to feed our wild birds?